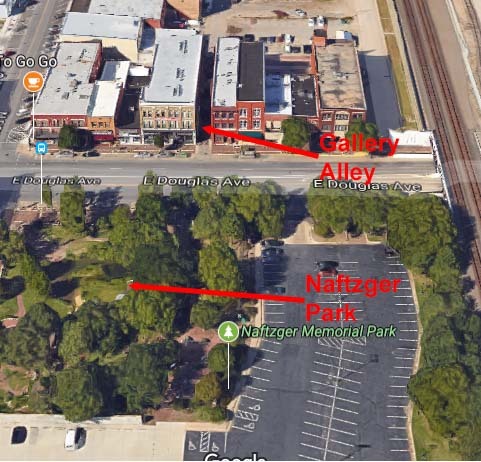 Naftzger Park concerts and parties? In Wichita, a space for outdoor concerts may be created across the street from where amplified concerts are banned. Amplified music is banned in Gallery Alley, but concerts and parties are proposed in Naftzger Park. But it was too much for the neighbors, according to Jason Gregory, executive vice president of Downtown Wichita. Now, right across the street from Gallery Alley, directly across St. Francis from residences at the former Eaton Hotel, directly across Douglas from the Zelman Lofts, and catty-corner from the Lofts at St. Francis, the city proposes creating an outdoor space for — get ready: Concerts and parties. By the way, the proposed use of the parking lot that abuts Naftzger Park is a “high-end mixed-use development” possibly including a hotel. I don’t know if this use is consistent with parties and concerts in its front yard.